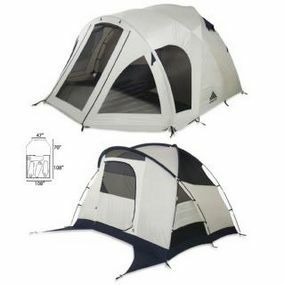 Family tents with screen rooms are usually highly rated, but Kelty Green River 4 reviews are terrible. Learn why Kelty Green River four person tents aren't the best for family camping. The Kelty Tent Company is known for producing quality shelters that cut costs and provide innovation. While most Kelty products are worthwhile investments, the Kelty Green River 4 Tent is not. That's not to say all Green River Tents are bad--the Kelty Green River 6 is one of the best family tents for camping. However, many of its advantages do not translate over to the Green River four person, three season shelter. 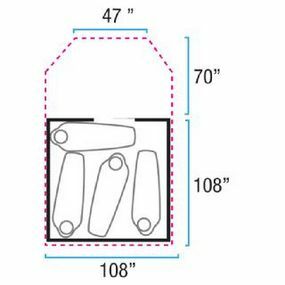 Packaged Size: 12" by 27"
Since Camping Tent Reviews does not even recommend purchasing the Green River 4 tent, we do not recommend purchasing the footprint either. However, if for some reason you are sold on this family shelter, then you should buy the footprint, too. It will extend the shelters lifespan and make the most of your (unwise) investment. However, the Green River 4 skimps on size. Whereas the Green River 6 allocated 34 square feet per person, the Kelty Green River 4 person tent allows 31 square feet per person. Then, you look at the height. The 6 person model allows people up to 6.5 feet to stand and move comfortably. However, in the Green River 4 by Kelty, if you are taller than 5'11" then too bad. You can't be comfortable. Finally, both shelters are waterproof and have a large gear vestibule. Nice perks to mask its shortfalls. As mentioned, one of the largest drawbacks is size (both max height and square feet). That aside, this family tent still has many faults. First up is the fact that it has fiberglass tent poles. Aluminum poles are far sturdier and more reliable. The last thing you need is a tent pole breaking while camping. What's the last thing you want to do after a two hour car ride to a campground? Pitch a tent, right? Well, it's inevitable that you'll be pitching a tent--what's not inevitable is how much time it takes you to do it. With Green River Tents though, you will spend about an hour pitching your shelter. Not fun. Finally, there's the issue of airflow. Like the 6 person model, the Green River 4 by Kelty lacks the cross-ventilation needed in a family shelter. When the gear vestibule doubles as a screen room, airflow is sufficient. However, you won't sleep like this so the airflow provided by the screen room is irrelevant. If you like the Green River Tents design and think it fits your needs, purchase the Green River 6 person model instead of the Green River 4 . It's a far superior tent for a similar price tag. Kelty Green River 6 Tent Review - Six Person Family Camping Tents - Green River Tents are one of the largest family tents on the market--but is bigger necessarily better in this case?